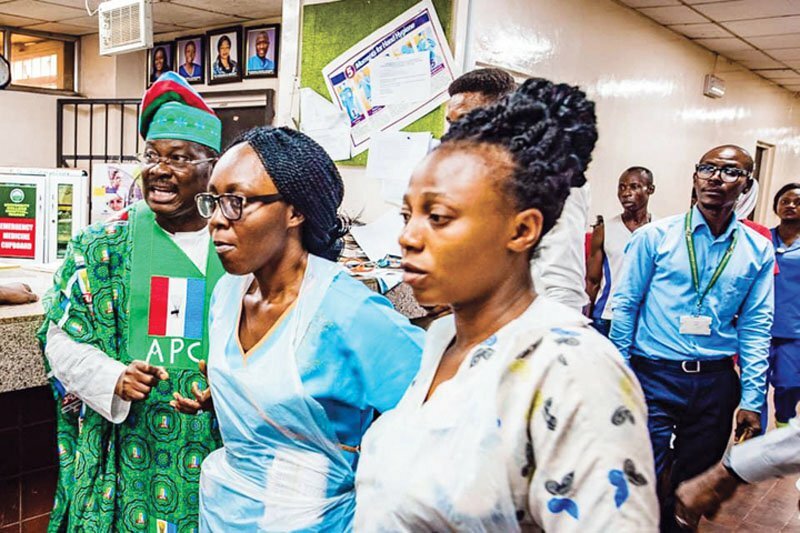 Passers-by and jubilant residents of Iwo Road in Ibadan, the Oyo State capital, have lauded the humanitarian gesture of Governor Abiola Ajimobi for rescuing and evacuating some accident victims in the capital city. Then governor was also said to have conveyed them to the University College Hospital (UCH) in Ibadan. The governor, who personally accompanied the accident victims to the Accident and Emergency Ward of the hospital around 5 p.m on Tuesday, had just returned from Ado-Ekiti, the Ekiti State capital, where he attended President Muhammadu Buhari’s re-election campaign rally. Sources said a hit-and-run driver knocked a motorcycle conveying the rider and his female passenger to the ground around 4 p.m. They reportedly sustained head injury and fractures. An eyewitness, Tajudeen Adebare, who sells tyres in the area, said onlookers feared that they might get into trouble if they rescued the victims and took them to the hospital without a police report, should any of them die. He said: “Everybody was afraid of going near them. A reckless driver, who ought to obey the ‘drive slowly’ signs placed on the road because of the expansion works, ignored the signs and drove recklessly into the area.